Carol's Driving School offers friendly, local driving lessons in and around Edinburgh and the Lothians. 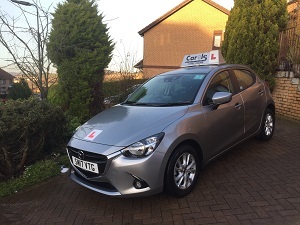 Whether you're a complete beginner and new to driving, or have driven previously, Carol can tailor driving lessons to suit your individual needs. Save money and get a discount on hourly prices by signing up for a block booking. Book a Pass Plus course whilst learning or within a year of passing your driving test and get a discount on car insurance. With Plus Pass you receive over 6 hours tuition on night driving, weather conditions, rural roads, city driving, dual carriageways and motorway driving.